Electronic Arts is unleashing the Outbreak DLC pack, a pair of new multiplayer maps for Dead Space 2 on the Xbox 360 and PlayStation 3, absolutely free. 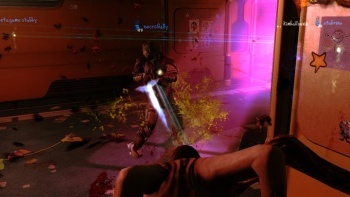 To me, the Dead Space franchise is an inherently single-player experience: one guy with a cool helmet and a Snap-on credit card, trapped inside oppressive, claustrophobic hallways with endless hordes of misshapen vomit monsters. But the multiplayer angle apparently isn't too bad either and EA is giving it some love with the Outbreak Map Pack, a collection of two brand-new multiplayer maps. Okay, two maps isn't really much of a collection, but it's also free, so it's not like there's a whole lot to complain about here. First up in Outbreak is The Academy, which will take you through the schools of the Sprawl as you fight to activate the decontamination system and then make your escape. The comes The Concourse, taking place inside the Sprawl's mall, where you'll have to evade the Necromorph onslaught long enough to send a signal to a rescue ship. Do these areas sound familiar to anyone else? I already massacred my way through one primary school on the Sprawl and I'm pretty sure I spent some time browsing the local shops, too. The Sprawl is, one would assume, a pretty big place, so it's a shame that these new maps don't appear to be going anywhere genuinely new. But again, there's that whole "free" thing, although that hasn't stopped legions of idiots from finding things to howl about on Facebook. The Outbreak Map Pack will be out "soon" on Xbox Live and the PlayStation Network; PC users, sadly, will have to get their lovin' elsewhere.